This is my first post here, so it's only fitting to do an analysis of Disney Princess history so far. I don't intend to only write about Disney Princesses in this blog, but they will probably make up the vast majority of it. As stated in the title, it's been 80 years since the release of the first animated princess movie (and animated movie in general), Snow White and the Seven Dwarfs. Since then, Disney has made over a dozen more princess movies, spanning through multiple generations of girls and women. That's a lot of history. With how much social norms have changed between the 1930s and today, it would have been very easy for the Disney Princess line to become a forgotten relic of the past. Yet, with an upcoming reunion in the Wreck-It Ralph sequel, the princesses are more popular than ever. Why? Disney updates their movies with the times. That's why they're called "classics." Each princess is a caricature of what is considered the ideal woman for that time period. Even though most of these movies are set in the medieval or Renaissance era, it's clear that the characters are made for the audience to relate to. They're not exactly going for historical fiction here. Because of this, Cinderella was written as a standard '50s housewife, Ariel was a rebellious teen of the late '80s, and Merida and Moana were modern heroines who don't need a man to rescue them. You might think that since Disney's newer movies are so successfully marketed to modern-day little girls, the older ones will collect dust in people's DVD libraries. Despite portraying outdated ideals that modern feminists are trying to overturn, Snow White, Cinderella, and Aurora have not been removed from the Disney Princess roster, nor will they ever be. This is thanks to Disney's enormous corporate empire, which allows them to continue promoting everything they've made until the end of time using merchandise, theme parks, re-releases, and remakes. In short, Disney is so big now that they are unstoppable as a corporation. 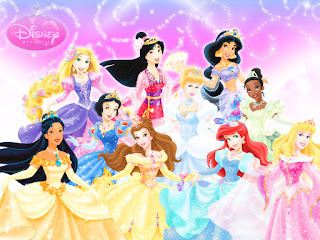 The idea for the Disney Princess line actually began in the year 2000 by Disney Consumer Products chairman, Andy Mooney. Even though there were already at least six Disney Princesses out at this time (eight if you count Pocahontas and Mulan), they had never been marketed together as a brand. Instead, each movie had its own merchandise line as it was released, which would inevitably fade into an occasional meet'n'greet in the theme parks. The idea for an entire brand based around the princesses as a line was, in short, magical. It gave girls a chance to pick their favorite princess, play dress up, and learn all the songs. 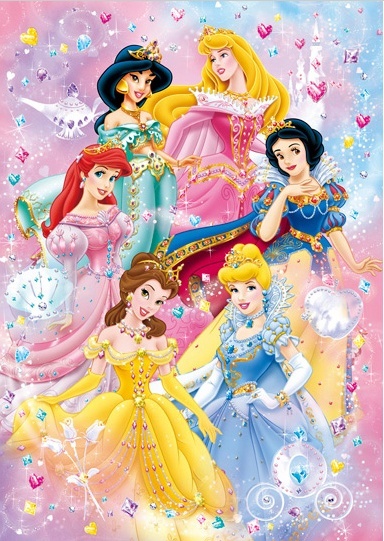 Despite the popularity of the Disney Sing Along VHS tapes in the early '90s, the first Disney Princess themed Sing Along came out on DVD in 2004. Each princess possessed qualities that all different types of girls and women could relate to. In a way, it makes sense that he princesses weren't branded as a whole until after the '90s because the early "Golden Age" princesses had approximately a decade-long gap between movies. Snow White came out in 1937, Cinderella in 1950, and Sleeping Beauty, which was actually considered a big flop at the time, came out in 1959. It wasn't until The Little Mermaid came out in 1989 and kicked off the Disney Renaissance that Disney began having gorgeous new animated classics coming out almost ever year. By 1992, thee were already three new Disney Princesses--Ariel, Belle, and Jasmine--who transcended the stereotypes of passive women who couldn't think for themselves. Yet, the image that Disney used to market their princess line in the early 2000s is still vastly different from the "Dream Big, Princess" campaign that Hasbro started in the past couple of years. They went through a variety of different designs, nearly all of which focused on big dresses, glitter, jewels, and vanity. They started to morph into multiple faces of the same person, one that valued beauty and riches and went against all of the messages portrayed in their films, such as kindness, love, and inner strength. This resulted in complaints from the director of Disney/Pixar's Brave because the "Disney Princess" image did not match Merida's personality or many of the other princesses in the line, such as Jasmine, who insisted that she wasn't "some prize to be won." Despite the fact that the Disney Princess brand was enormously successful, there was so much more that could be done with it. In early 2016, Hasbro bought the Disney Princess toy line from Mattel. They sought to change the brand to something more about empowerment, and less about ballgowns. Thus, the "Dream Big, Princess" campaign was born. It happened not a moment too soon, with Moana just around the corner, which promoted empowerment in girls even more so than any other princess movie that came before it. The campaign focuses on girls being active--winning races, swimming, painting, and anything else that encourages creativity and diversity. In many ways, it was quite similar to the Barbie "Be Anything" campaign that was released just a few months prior. So, how does Disney manage to keep their princesses relevant as times change? The answer, as you can see, is rather complicated. It's a combination of having a long legacy of characters that are well-known in pop culture, constantly releasing new characters that evolve with the times, and regularly updating the way they market those characters to appeal to the modern girl. 💕 Disney Princesses! We will forever miss the look of the classic Disney doll from Mattel. The Hasbro ones are ... weird. Oh! And fun connection to ✨Princess Gwenevere and the Jewel Riders✨, Greg Autore, Art Director, worked with Mattel during the launch of the Disney doll line and created my favorite Disney dolls- the Classic Collection from the early 90's!